The men are told that they will be skinned and eaten and then their skin will be used to make canoes. Then they are each given a final request. The first man asks to be killed as quickly and painlessly as possible. His request is granted, and they poison him. The second man asks for paper and a pen so that he can write a farewell letter to his family. This request is granted, and after he writes his letter, they kill him saving his skin for their canoes. Now it is the third man's turn. He asks for a fork. 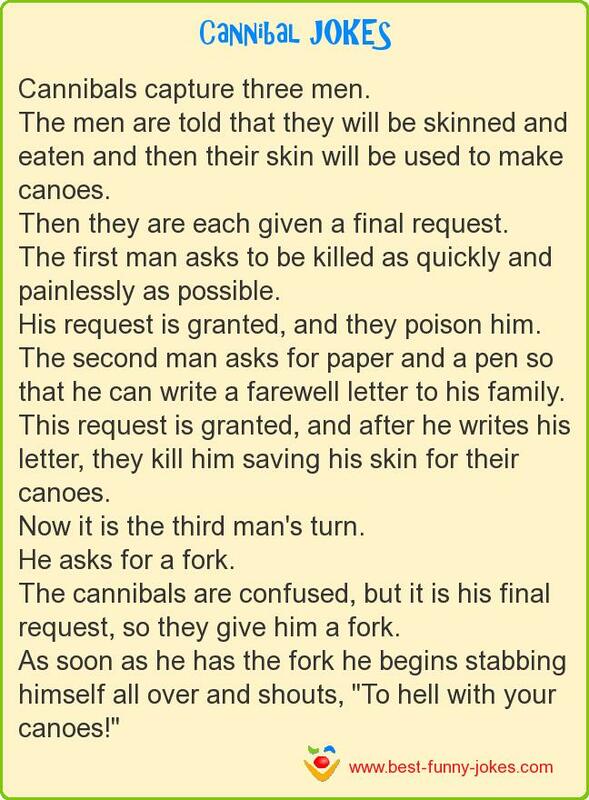 The cannibals are confused, but it is his final request, so they give him a fork. As soon as he has the fork he begins stabbing himself all over and shouts, "To hell with your canoes!"